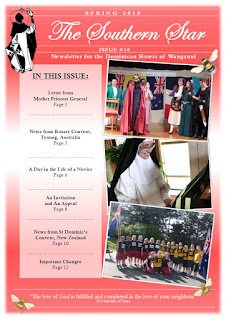 The Dominican Sisters of Wanganui: Learn More About the Call to the Consecrated and Religious Life! Are you interested in a Dominican Vocation? The Spring Newsletter has a special on What Do Novices Do All Day? (And other Sisters too.) Take a peek; perhaps you might find yourselves called by God to consecrate yourselves to Him in the Dominican Order! The Dominican Sisters of Wanganui can trace their ancestry back to St Dominic's 1206 foundation at Prouille. A convent at Galway in Ireland was founded in 1640 from Prouille. This convent founded other convents including Cabra in Dublin. From Cabra a convent was founded at Sion Hill, also in Dublin, and from Sion Hill ten Sisters came to Dunedin in 1871 to found Dominican Convents in New Zealand. In 1997 a New Zealand Dominican Sister came to Wanganui to teach in the schools run by the Society of St Pius X. In January 2002 two young ladies from Australia joined Sister in the hope that a religious congregation would be founded. On 8 December 2002 Bishop Fellay gave permission for the foundation of a Congregation with the status equivalent to a Congregation of Diocesan Right. Since then other young women have joined the Dominican Sisters of Wanganui. At present, as of April 2016, there are 18 professed sisters, 7 novices and 2 postulants, representing New Zealand, Australia, South Africa, India, Canada, the United States of America, Singapore, Samoa and the Philippines.